Free shipping on full-priced items over $49.99. Other restrictions apply - see site for more details. Regarding free shipping offer: Shipping restrictions may apply to some remote locations. Orders will not ship to P.O. boxes. Entire order must be shipped to a single address. Does not apply to prior purchases or open orders and cannot be combined with any other offer or promotion. Customer is responsible for shipping costs on returned merchandise. 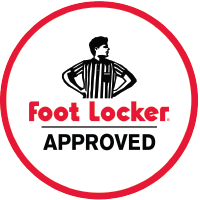 Promotion may be modified or terminated at any time by Foot Locker. Certain restrictions and exclusions may apply. Any order that includes a new release launch item does not apply and will incur standard shipping rates.